Sign into Google Plus and go to your Google Plus Profile Page. this is the default setting for showing your friends in your Google Plus Profile page. As shown in the above preview click on All circles as shown above preview and select the circles (automatically select the members of that circles) of which you want to show in your Google Plus Profile Page. You can select one or two or as many circles you want to select. 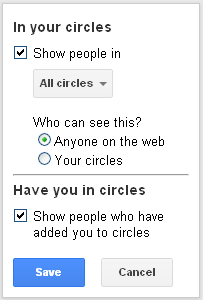 If you want to show particular/specific friends to your Google Plus Profile page then create a new circle and put your friends here and then choose this circle to show in your Google Plus Profile. If you want to show fix friends forever to your Google Plus Profile then choose your best 8 friends and move these to a new circle and then choose this circle to show in your Google Plus Profile. 4. Now what you selected in step 3 basically who can see it. As shown in the above preview "Who can see this?" choose "Anyone on the web" for publicly show your friends OR "Your circles" for your friends who have in your circles. 5. In the last(Have you in circles) section in the preview of Step 3, by default the people who have added you to circles will show publicly and if you don't wish to show them simply unchecked this option. Finally SAVE it!